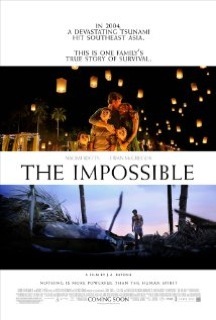 Review: “The Impossible” was inspired on the real events lived by a family, during the catastrophic tsunami that has devastated Thailand in 2004. The images are absolutely impressive, showing chaotic landscapes and the tribulations lived by those who were hurt or looking for their families. Although visually appealing, the movie adopted a questionable approach. When mother and son entered the hospital, they didn’t show any concern with the whereabouts of the rest of the family. They didn’t even mentioned them. I found this particularly strange. With flair for the dramatic side, “The Impossible” increases the viewer’s despair with a sentimental soundtrack and evinces some staged situations, hoping to touch your heart and impress your eyes. Bayona's direction, clearly aiming for massive audiences, reduced the chances of creating a more effective film from this particular drama.